Looking for a place to rest? Today’s project is a Halloween décor piece that I’ve been working on and off for a couple weeks now. Last night I put the finishing touches on it and I’m calling it done! First, let me explain how this project came about. 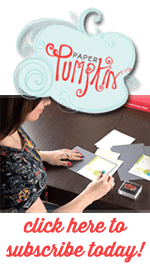 I recently attended a scrapbook class at a local store and the store had tons of ideas sprinkled around the room. One of the ideas was a mini Halloween album with a 3D coffin on the front of the album. 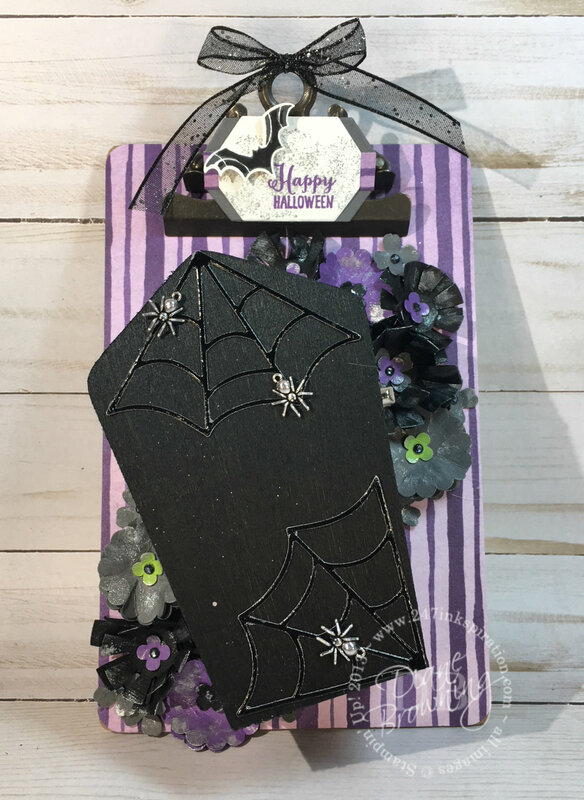 I loved this idea, adding dimension to the front of the scrapbook. But, I honestly don’t take an album’s worth of Halloween pictures every year, specially now that I have older teens. So I mentally stored the idea for maybe some future project. Then I was recently putting away some craft supplies in my studio and came across this mini clipboard. I knew it would be perfect for the 3D coffin idea. The coffin came from a local craft store and I painted it black. The webs come from the Cauldron Framelits. The spiders are the Spider Trinkets. They come on a jump ring so you can hang them, but I removed the jump rings for this project. Of course, I couldn’t just have the coffin on the clipboard. I needed something to help fill the space. I made my own flowers from a variety of punches (see Supply List below) and layered them all together. For the center of each flower, I colored our rhinestones with my Dark Basic Black Blends marker. It’s an alcohol marker so I don’t have to worry about it rubbing off. I added a quick brush of Frost White Shimmer paint the flowers to provide a bit of shimmer. The inside of the coffin is decorated too… more webs and a spider on the left. On the right I added a couple ghosts, lots of sequins, and lots of mini flowers in the Halloween colors. To keep all the sequins and flowers inside the coffin, I glued a piece of our window sheet to the top of the right ride. You can shake away and the stuff is not coming out. Luckily, the Window Sheet is thin enough that I can still fasten the latch on the coffin to keep it closed. Everything is glued to the clipboard using a hot glue gun. With decor pieces that tend to get touched, you definitely want to use a hot glue gun. It will help your project stay together for a lot longer than it would otherwise. I hope you enjoyed today’s Halloween clipboard. Don’t worry, I have more Halloween tricks up my sleeve which I will be sharing soon.